cards, photo books and more! 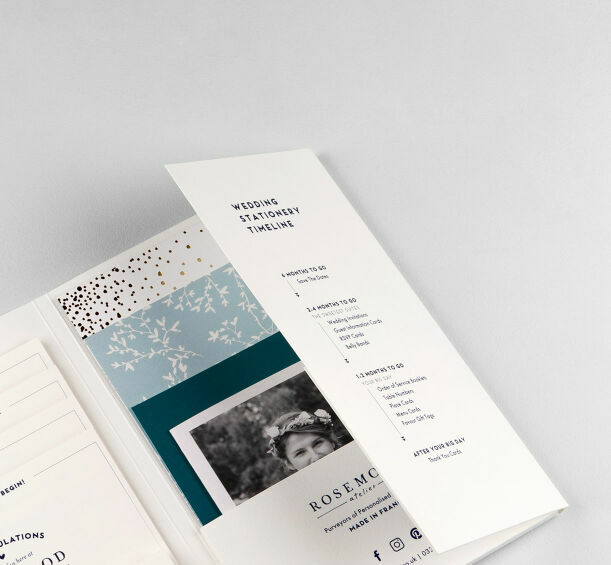 Thanks to our talented designers, wedding stationery isn’t the only personalised stationery that Rosemood has to offer! We also have a wide range of thank you cards, personalised notecards, christening invitations and other personalised stationery to ensure that each holiday and special occasion is as unique and celebratory as the next! You’re sure to find the perfect personalised wedding invitations and personalised thank you cards in our collection of wedding stationery and the perfect everyday stationery in our collection of personalised stationery and stationery sets. You can also adapt any of our cards to the event of your choice using our online editing tool. Why not transform your favourite wedding invitation into a hen night invitation or your favourite baby thank you card into a baby announcement card? The options are endless and we're here to help you, every step of the way! As your wedding invitations are the most essential part of your wedding stationery, we are careful to pay close attention to each and every detail of your personalised wedding invitations, treating them as if they were our own. We know that preparing all of your wedding stationery from your save the dates to your wedding thank you cards can be quite the task so we have made it our goal to help make ordering your wedding stationery online easy and enjoyable! Our secret? We proof read every card, retouch every photo and harmonise every page layout to make sure your cards look their very best! From Paris to New York, our young designers carefully craft unique designs just for Rosemood customers (with a bit of a French touch of course)! Our team goes above and beyond to make sure that you love your cards and if it isn't love at first sight, we will happily reprint them for you! What better way to introduce your little one to your friends and family than with baby thank you cards! Show your loved ones just how much they are already appreciated with a personalised message on one of our baby thank you cards. Designs in our collection range from traditional to modern and include baby boy thank you cards, baby girl thank you cards and thank you cards for twins. All of our baby thank you cards are designed exclusively for Rosemood by our talented team of graphic designers. Over 20 different colour options are available. Wedding invitations come in all shapes, sizes and styles. To help you navigate the maze of rustic wedding invitations, vintage wedding invitations and everything in between, we have sorted our catalogue of wedding stationery into several categories. You can use the filters to the left of the catalogue page to find your favorite wedding invitations online in a jiffy. Then use our editing tool to create your personalised wedding invitations. If you’d like to make any changes beyond the personalisation available in our editing tool, contact us and we’d be happy to answer your questions and give you a quote for advanced changes. Once you find the perfect wedding invitations, we offer a complete set of matching wedding stationery including RSVP cards, guest information cards, order of service, place cards, table numbers, wedding menus and last but not least, wedding thank you cards. Choosing the wording for your wedding invitations is an important part of personalising your wedding stationery. It is certainly worth the effort to ensure that the text on your wedding invitations is coherent and harmonious with their style and design and is a reflection of your personality. Your wedding invitation wording also helps guests understand if they’re invited to a formal event or a more casual affair. The wording on each of our wedding invitation designs has been carefully chosen to match its style but we certainly invite and encourage you to adapt the wording to your special day. If you have an idea of the message you’d like to communicate but aren’t sure exactly how to word it or if you just have a classic case of writer's block, then take a look at our wedding invitation wording suggestions for day and evening wedding invitations. Make sure your guests are available for your wedding day with our save the date cards. There's nothing worse than picking a date and planning your wedding only to find out that your second cousin Becky can't make it! Avoid this mishap by sending save the date cards to your guests as soon as you have chosen your wedding date. When it comes to gathering your friends and family near and far for your special day, the more notice the better. Some of our save the date cards are designed to match our wedding invitations while others are stand-alone products for our brides and grooms that may have a date but haven't quite yet chosen a wedding style or colour theme. Save the date cards are a great opportunity to have fun and show off your personal style to your loved ones, leaving tradition to your official wedding invitations. Take a look at our range of save the date cards for more ideas! Rosemood offers a stunning range of magazine-style softcover photo books, as well as luxurious fabric hardcover photo books. Choose from our range of designs and formats to choose the perfect photo book for your special occasion. As with all of our personalised stationery, our team will go above and beyond to make sure that your photo books are absolutely perfect. Our professional proofreaders will check all text added to your photo books, whilst our graphic designers will check and optimise the quality of your photo books for printing. 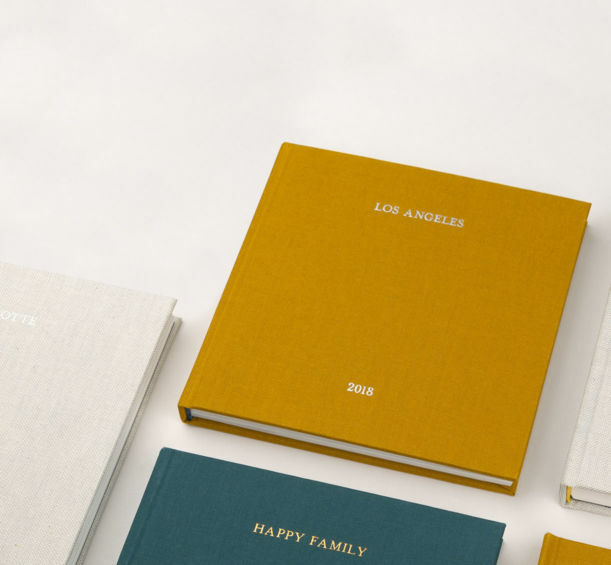 All of our photo books are then printed and bound at our very own printing studio with the highest care and precision. We have relished the challenge of designing and perfecting the finishing touches that make our photo books so special and aim to help you create photo books that you can pass down from generation to generation. Did your Great Aunt Thelma go above and beyond on your wedding gift? Did your best friend spoil you at your baby shower? No excuses then, put down your smartphone, avoid the urge to send them a thank you text and take the time to order some personalised wedding thank you cards or baby thank you cards that are as beautiful as your friends and family are generous. Treat your loved ones’ post boxes to a handwritten thank you note on a personalised thank you card. Rosemood’s thank you cards are so lovely that you and your friends and family will want to hang them on the fridge or keep them as a momento of the happy events in your lives. You can even include a snapshot or two of your new baby on our baby photo thank you cards so that your Great Aunt Thelma can show his or her cute little face off to her friends at Bingo night. Now that’s how you say thank you! Your baby’s Christening is a once in a lifetime event, an important religious milestone and likely one of their first social gatherings with friends and family. If your baby could talk, we’re sure he or she would call everyone up to invite them to this special celebration, but as that’s likely not the case, Rosemood offers a range of modern or traditional Christening Invitations and accompanying Christening stationery to send by post. Whether you’re planning a classic elegant Christening or a laid back garden party style Christening, there is sure to be a Christening invitation design that is perfect for you. As with all of our stationery, you can personalise your Christening invitations with your baby’s name and more. Matching order of service booklets, menus, gift tags and Christening thank you cards are also available to help you keep all of your Christening stationery coherent!